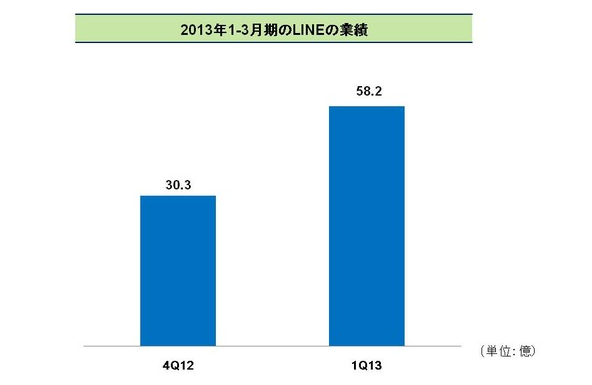 Line, a free-at-the-point-of-use messaging app made by Line Corporation (formerly operated by NHN Japan Corp) which recently passed 150 million worldwide users, has announced earnings for Q1 2013 — revealing for the first time how much of its revenue comes from game in-app purchases and how much from its other shtick: stickers. Line uses free social messaging and gaming services as its hook to draw in users, and monetises its offering via entertaining add-ons that can be purchases within its apps. Breaking the revenues down by content type, game in-app purchases account for around half (50%) of the Q1 revenues, while paid stickers (Line offers some free stickers) generated around a third (30%). Line also reveals that it now has 24 “seed games” — or games that can be downloaded from within its main messaging app — 191 varieties of stickers and 92 official accounts (for celebrities and brands) across Japan, Thailand and Taiwan. The company notes it will be reporting earnings regularly from now on, and also indicates that it will be adding new types of in-app entertainment content — mentioning shopping and music as two areas of focus, among others. It also says it plans to strengthen marketing of its app in Asia, Spain and South America, but interestingly does not mention the U.S. — where Line launched back in January. Asia evidently remains Line’s primary market but there is plenty of messaging variation and competition within the region. For example, Chinese WhatsApp rival WeChat — made by Tencent — has now passed 190 million monthly active users.